Lee at Tossing It Out has asked us to do a reflection post regarding the A to Z Challenge. For those of you participating, post the link to your post below. And Elizabeth Mueller made this really cool award badge for those who survived. Thanks, Elizabeth! I was amazed at the variety of posts for each letter. You guys were really creative! I was also surprised by the variety of blogs participating, many of which had nothing to do with writing. Thanks again to Lee for asking me to be one of the co-hosts! I just have two things I want to say about the Challenge. Last year, there were only one hundred of us. We were able to visit everyone and it felt more intimate. I made some really awesome friends as well. This year, visiting every blog was almost impossible. (This Ninja failed!) And in trying to do so, I realized it was more difficult to foster friendships. I’m sure a lot of people lost steam after the first week or so. Those using the special widget started at the beginning, although I think many switched to the ‘surprise me’ feature. I think a lot of blogs were overlooked. Hart had an excellent suggestion, one I think we should adopt for next year. We start with the blog immediately following ours on the list. We go as far as we can, and if that’s only one hundred blogs, that’s fine. But that way, everyone receives visitors and no one feels overwhelmed. Last year, my goal was to survive the month and gain some new followers. I made it to the end and almost tripled my following. This year, I didn’t worry about gaining a ton of new followers. Yes, I could’ve followed everyone I visited and gained a ton of new followers. But that wasn’t my goal. I wanted to be a good co-host and spend the Challenge featuring my current blogger buddies. This community is so awesome and I wanted to give back. As a side note, if you are following me but I’m not following you, please leave a comment! The Google Friends Connect sometimes doesn’t link a blog to your icon, but if you leave a comment, I can find your profile – and your blog to follow! You guys are awesome and I hope everyone had a blast. It was really cool to hear how many were enjoying the Challenge and meeting new bloggers. That made it all worthwhile - to know there were bloggers in the same position that I was last year reaping the benefits. That is who this Challenge is for, and what keeps it fresh. Let’s make next year even better! Yay for Naked Tart!! She's so beyond fab!!! And she's started the Naked Revolution too - which is just amazing!! Anyway!! Am I the first to comment?!?! Yay! It's like well beyond midnight here and I really should not be up at this time of the night in my old age but how could I resist a blog post from Cap'n Ninja himself??? Is this going to be an annual thing then?!?!? Yikes! Will I be around this time next year?!?! Who knows!! Will Bassa be resurrectied for Cassastar 3? If only - yes please!! LOL! Oh well - so long as I can have my cold showers after! LOL! I agree that it was somewhat difficult to foster friendships during the event, just due to the sheer number of participants. But at the same time, we connected with a lot of new people (great people! ), and hopefully as time goes on (and we get back to our normal blog routines), those new connections will grow into something more. That's a great suggestion of Hart's. I like it. Yes, I agree. The challenge was a blast. This was my first year and I did not know what to expect but have come to appreciate it a lot. I also like the suggestion from Hart. I started using the "Next" and "Surprise Me" widget but it keps taking me to the same blogs early on in the challenge, so I stopped and went by the Linky List. I started to get a little bored with all of the writing until you mentioned where it got interesting so I finished up a few that I was reading and then went to that area to continue from there on out the next day. With so many blogs that signed up, I'm still making my way through but after coming across a few today that did not participate, I may eventually decide to just stick with a few per day. I think that's a great idea - I know one reason I hesitate to participate in A to Z is b/c I know I won't make it around to all the blogs. From what I saw of the Challenge, it was a great success! This sounds like such a fun idea! Sorry I missed out AND sorry that it has been a while since i've been by! Hi Alex ~ Thank you for co-hosting this challenge. It was an awesome experience for me! I had wanted to start a blog and this challenge got me going. What an amazing month! That is a good suggestion. I read another one somewhere this morning that suggested that (since there were co-hosts) each list could be limited to a couple hundred. We could pick a host and work on that list....or work from the list we're featured on...? LOVE Elizabeth's badge & Hart's suggestion. 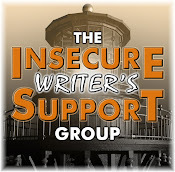 I so appreciate your feedback, Alex, because at times I felt inadequate not being able to re-visit blogs I really enjoyed because I thought I was supposed to get to all of them. I like your suggestion for next year. Hart's suggestion makes a lot of sense and Elizabeth's badge is beautiful! So glad we made it through! (Though I barely did). I like that idea Hart had. I wasn't focused on visiting too many blogs as I was trying to follow ones I felt "attached" to and focused on those....Even that was a challenge for me! Here's to better planning on my part next year! It was a blast, and well worth the extra effort. I'd do it again. I can't read as many as I'd like. My reflection post is up! I didn't get many followers or follow as many blogs as I would like to due to time constraint, but I will continue to visit bloggers who had participated in the Challenge. It was an exciting and fun month for sure. I look forward to reading the reflections. Take care Alex and thanks again! Good job summing up, Alex. I didn't know about the A-Z challenge last year, but I totally get the differences as you put it. I think your (Hart's) suggestion is a good one for next year! Kitty, you are the first! And I wish there was a way to bring him back - it was difficult to say goodbye. Liz, I did make some new friends as well. Nicole, I started in the middle and still didn't make it through. But there was quite the variety in the ones I saw. Tracy, YOU are the reason we did the Challenge! Words, that's an idea as well. Karen, that's why I didn't make it further. I wanted to give quality time to the ones I did visit and to my blogger buddies. Maggie, welcome to this awesome community! Grandpa, now that it's over, I will visit you more often! Thanks everyone and be sure to tell Hart thanks for her awesome idea. Thanks Alex for your great assistance in being such a congenial and ambitious co-host. I've already been seeing some great suggestions here, in comments, and on other reflections that I've read so far. I sure it may take till the end of May just to read through and think about the Reflections posts. I will touch upon a few of these in my own Reflections post that will go up in a few hours. Thanks for a great job Alex and the rest of the A to Z Team. I'm just about to do my reflections post! You, Lee, and the other co-hosts did an amazing job. It was tough, but you all managed with effervescence. Hart's idea is a good one. I kind of jumped around in my visits so not to be in the beginning or end. I hope you got some rest this weekend. Thanks Alex. I used my Homepage url for the Link, rather than the Reflection Post, is this ok, or do I need to re-Link? Yes, definitely a very wide variety of posts. The award badge is hilarious. Love it! "A to Z" totally rocked, though I was a tough challenge, no doubt about that. Congrats to everybody who survived it. Like you, I didn't get around to visting every blog and feel truly sad about all the awesome posts I must have missed. I think Hart's suggestion is a great idea! The Challenge was awesome. It was the first time I'd done it and will definitely do next year's (she says, hoping there will be one). My only regret was that I didn't get around to everyone so that's a great idea of Hart's. I'm going to be honest and admit I didn't make it past the first week! The sheer numbers involved was too much - not a hope in hell of making it round to everyone listed and I've always prided myself on visiting every blog listed in a blogfest. Thanks so much for the awesome job you guys did! It was truly a daunting task and you all did a wonderful job handling it. Visiting and keeping up with commenting was definitely overwhelming and not really sure the solution to this but it was so much fun. Lee, thanks again for inviting me to co-host the event! Michael, thanks, and I did indeed rest this weekend. Grandpa, I can fix it for you. Nebular, knew you would! Sorry, I chilled a bit this weekend (and saw Fast Five - awesome!) so I'll go check out your review. Francine, it was a bit overwhelming. Dafeenah, glad you enjoyed it. I was gone last week, so I'll reflect tomorrow. I did find the number a tiny bit frustrating. Because quite a few that signed didn't participate or forgot, or had nothing to do with writing for kidlit. So I tried but eventually gave up on the list because it was hard to keep clicking around to get nowhere. But I did find some new blogger friends so that what cool. I like the idea of starting where you sign in and visiting from there. I was overwhelmed. I wonder if there isn't some way to break the bloggers into groups next year so that you have a group of people to meet and support for the whole month instead of trying to rush through as many blogs as possible? And then venturing outside your group can be done only if you want to. After the first ten days or so I kind of returned to the first few blogs I discovered and didn't venture out to find too many new ones. I did, however, start with the blog right after mine and went down the list that way. The number was overwhelming! I like the idea of beginning with the blog after mine next year. Give me a place to start. It was a fun month Alex, I couldn't get through all, but I enjoyed myself and that's what it's all about at the end of the day. Thanks to eveyone who made it go smoothly. Well I don't know how you kept up at all Alex... so many people and so many wonderful blog post to read. My head spins just thinking about it. It makes me feel a little better to know I'm not the only one who didn't get to every single blog. Thanks for hosting this, though. I made some friends and gained a lot of followers, which was wonderful. I liked Hart's suggestion as well because it was impossible to visit all the blogs, but 100 or so is workable. It was great to meet many new folks and to go over 100 followers! I like those suggestions. You did a great job featuring other blogs. Hart had a great idea! I like it. I got to over 300 participants so overall I hit about ten a day. That's in addition to visiting my regular visitors. Looking forward to net year! Laura, it was a mix, but I found some I wouldn't have discovered otherwise. Sommer, you started in a good place! I thought it was fun crossing blogging genres, but I also hit a lot that just didn't appeal to me. Thanks everyone - even better next year, right? I was surprised by the number of blogs (6-9) I went to that had posts but no comments - at all. I left mine, but it did make me wonder what was going on. Sounds like A to Z may have outgrown itself! It's still a very cool idea though. Hart, you always have a plan, don't you? Holly, I saw a lot like toward the end of the list. Like, the last six hundred! Awesome, Alex! You were a fantastic host. SOmetimes it's nice not to stress about trying to visit every blog, but just enjoy the ones we do meet and accept we can't get to them all. This turned into way more than I ever expected, and I still met lots of cool new friends! Even though I didn't do the challenge, I had a lot of fun reading these posts! I didn't even make it halfway through all the blogs. I tried. I'll try to get through more over the next month. Maybe. It was fun and gave me ideas of how to come up with blog posts when stuck - start a new A to Z - on a slower schedule, of course. I didn't realize I was supposed to do a follow up today, so I will say something in tomorrow's post that I've already scheduled. I started at the end, twice, since people kept signing up. I followed those who left comments back to their blog as well. I know I got to over two hundred. Sounds like this was really fun. I'll have to try to take part next year. MPax, the list will be up through May if you'd like to continue. Nancy, that would be great. We want to know what everyone thought about the Challenge. I had fun but I admit to beg overwhelmed. Posting wasn't so bad because I scheduled. Visiting was out of sight. I don't think I'll be doing anything that big again. Dude I just posted about you being brilliant for creating the A to Z contest. It's was a great way of bringing all types of blogs together – and you are the mastermind of that. Kudos to you sir!!! Thanks for being a supportive co-host, the challenge was a riot. I didn't get to everyone either. Too bad. I like Hart's suggestion for next year. Mary, you were smart to pre-schedule! LTM, I think you're right. I had so much fun with the challenge. I was so glad to be able to participate and meet so many new bloggers! Now I'm curious...what the Blog Hop? Thanks, Alex, for co-hosting! Cyber Champagne for you! Oh, and I'll be sure to reflect tomorrow! I had fun on during the challenge, but I didn't get to most of the blogs either. It was wonderful that there were so many people taking part though. Thank you Alex for working hard and for working hand in hand with Arlee. 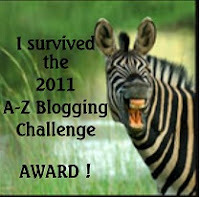 I joined the A-Z Challenge for the camaraderie and comraderie that you two have developed in this blogging community. Now that it is over, there was a slight but temporary relief, but the feeling of wanting to do it again is even stronger. Inspired by Lisa listed her favorite posts of each letter. I really think that would be fun to be included in the reflection next year. Thank you again, for your care and passion. Kris, glad you had a blast! Ocean Girl, that's a great idea! And sorry I had so many issues trying to comment on your blog. I like the suggestion of starting at the blogs listed after ones own. That sounds like a good way to spread out the visits. I really enjoyed the challenge and I'm looking forward to next year. I'm also planning on stopping by blogs that I didn't get to in April. At first I missed the intimacy of smaller blog hops too, but once I stopped hopping around like a crazy person and kept to a more manageable goal of at a minimum visiting those who visited me, I did form some fun new blogging relationships. And you know what Charlie Sheen would say about that...WINNING! The next year's approach sounds most reasonable! I had to bail because of family problems, but I never could have visited that many anyway. What's the point? Your view is mine also. I want quality. I want to keep in touch with the friends I've made. It's nice to add a new follower once in a while, but there are only so many hours in a day/week/month in which to comment. We can get Blogger burnout if we're not careful. Thanks for taking the time to comment just now on MY blog. You for one know how exciting it is to have a book released. I never thought I would hit everyone on the list. I do think the 'surprise me' button was a great idea. Even with such a great number I did make some nice new friends from visiting them or vice versa so it does work. And I would do it again! I'm very glad that you and those who organised this 'A to Z Blogging Challenge', complete with the exclamation mark, for dramatic impact, have found this to be an inspirational venture and got to discover a bit more about the diversity of the blogging community. Now, I was not involved and never would be involved. I do my own thing. However, dude, all the best to you and all those who were involved. 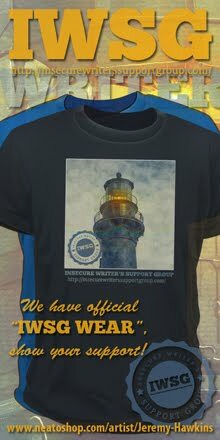 Although, I never self-promote, I shall do some more satire, alternative postings to your challenge in 2012. Take care and happy writing. I think the Challenge was awesome but I did feel like a failure becuase I didn't get around to a lot of the blogs, plus there were so many that I felt I was neglecting my followers that were into participating in the challenge. so if you are a dog lover, do you mind helping me out with a cause I have posted on my blog? go check it out and every little bit will help...thanks! Ella, glad you enjoyed it! And do participate in the blogfest. Still a whole month away. But hey, I'm totally with you. Ann, we're on the same page. And yes, I know you must be so excited. Or about to freak. One of the two! Heather, that's good to know! Gary, some of the best bloggers I know didn't participate, and that's cool as well. Tracy, a few have suggested that. I really like Hart's idea - just start and go as far as you feel. And certainly don't feel like a failure! I enjoyed everyone's entries that I read. I knew April would be too busy to participate! Hart does have a good suggestion to spread out the visits on the new blogs and not be overwhelmed. I didn't do the challenge, but I really enjoyed reading everyone else's entries. The variety was amazing and made it a lot of fun. Good for you guys! I never would have survived and would have blown a circuit trying to visit everybody. You AtoZer's have major stamina (and a very cool mascot). I'm very impressed! I enjoyed it vicariously from the sidelines, but I think you've hit on something - we can only "connect" with so many people, and that's important to keep in mind. Because the connections are important (at least to me). The a-z challenge was huge this year. I wasn't signed up for it but when I visited my buddies I was amazed, like you, at how creative everyone was with their postings. It was great stuff. My goal was also to find new friends and therefore I did not visit a ton of new blogs. I think this is the second or third time I have visited yours and I just now hit follow. I thought I had actually followed you the first time I visited. Plus, I notice you on Hart's blog all the time. I think that's a great plan for next year, Alex. I didn't make it through all the entries either. :( I think I hit about 140 new blogs. For me it was a nice experience and face a majority of writers. Yes, my A to Z has-been dedicated to titles of poems by poets, Men and Women, all now dead. Something like "Club Dead Poets Society." I left for the end to Federico Garcia Lorca, Murdered by His ideas and one of the Greatest Spanish poets. I have met people that we are still different after challenge. A big hello and very grateful to the organizers. Alexia, we didn't want anyone frying brain cells! Susan, you are absolutely correct. Sue, I noticed the later blogs didn't see as much action, which is why I skipped even further to the end when visiting. Leovi, glad you joined us and shared your photos with so many new bloggers! Thanks Alex for being a host of the challenge. This sounds like an interesting challenge. Too bad I missed it! I'll try to remember for next year. Can you suggest any other blogging challenges along the same lines, especially those geared to fantasy writers? It was an awesome and well done challenge! Skate over to my blog and read my reflections on the A to Z Challenge! Aj, the more blogs you follow, the more you will find them! Sorry, my next blogfest on June 6 has nothing to do with writing, although it could! Wow. Dude. That is a lot of blogs for one challenge. My hat's off to you, hon. Super blog challenge. I came across some really great one! Thanks to everyone in blogland. During the A to Z challenge I discovered loads of entertaining blogs bursting with life. Carolina, it was a lot! Spacerguy, glad you enjoyed it. N4M - no idea what I'm doing right, but hey! Congrats on completing the challenge! I've been curious to hear how the participants fared in visiting the other's blogs. I struggle with any blogfest over 50. Can you take my name off of this Linky? I didn't read it well enough and added my name thinking it was related to the "fun and games." I thought I'd already signed up for that one, but couldn't find my name. Well, no duh! It's the wrong one... The fact that I had just posted a "reflections" photo (for a whole different bloghop, is amazing. Anyway, I'm sorry that I did this. I didn't sign up or A to Z (no time) and surely can't reflect on it...Sorry about that! Vicki, some were overwhelmed, but most learned quickly just to visit a small batch. Pat, took care of it dude! Thank you for co-hosting such an amazing event that I didn't officially sign up for but I romped through A to Z anyway. ...and of course, thanks for a lovely reflections post AND for featuring many fine bloggers through the challenge. Hi Alex .. I thoroughly enjoyed it - although it slightly filled me with fear and trepidation! However on reflection and as I've posted some ideas .. I'd say definitely don't break us into groups .. categories is difficult - because I like to follow different people .. so the A - Z gives me a chance to find like-minded people, who are prepared to accept a challenge ..
a few other aspects would help .. ie getting the comment page to pop out as yours does .. this probably makes commenting easier for everyone - including the blog owner - as you can write adjacent to the comment you're commenting on. trying to get everyone to write short posts .. ie max 500 words .. I was going to do 200 or so - but they got stretched, luckily everyone seemed to enjoy them. Don't be clever .. eg going from Z - A .. it's bad enough with so many blogs going - wondering what's happening .. and I found where the posting was shared between two people a bit frustrating .. there's enough to do anyway without jumping around! Z - A can be done in May .. I'm sure I've got some other thoughts over and above my own Reflections that I never wrote about ..
Don't panic, take it slowly and enjoy - make sure you connect with some new bloggers and have fun! I sure did .. and lots of bloggers to catch up with during the coming weeks ..